As many parents of a nonverbal child, we have prayed for our son to find a way to communicate. Teaching him sign language can help, of course. It does take time however for the child to not only learn the sign but make the connection between the gesture and it’s meaning. This morning, Pookie was just having an “off” morning. He was moping and watching out the kitchen window. At that window, he is able to see the dirt road in front of our home. I took him to the rocking chair and trying to comfort him as I endeavored to figure out what was bothering him. Not having any luck, I asked if he would like to paint. Painting is always a favored activity for Pookie. If he is stressed or over stimulated, painting will calm him. I set him up to the table with a palette of various colors of Tempura paints to choose from. 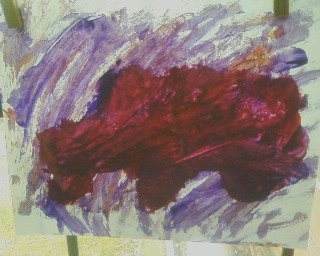 At first, he did simple broad strokes to make a background in purple. When he kept going back to the paints, I would guide him to the lighter colors, but he knew exactly what he wanted. He kept going to the purple. I tried guiding his choices to see if he was making a true choice or painting aimlessly. His insistence in color choice proved it was a definite choice on his part. Next, he went for the red paint and began brushing it into the purple, which darkened the red further. After a few moments, I began to see an image appear in his painting. He was showing me what was on his mind. Below is the painting that he made. I took a picture of it as it hung to dry in the window. The backlight from the sunshine makes the focus of his painting really stand out. Keep in mind, he is 4 yrs. old. What was on his mind? He is missing his Daddy, who is a truck driver. He painted Daddy’s truck.